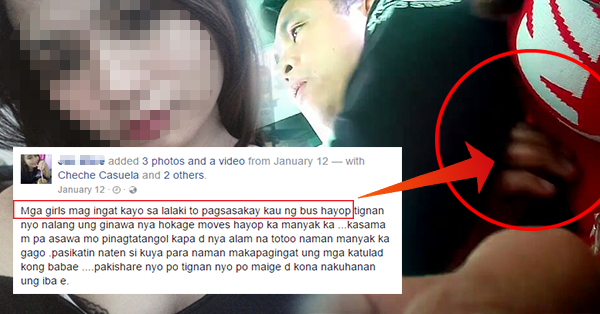 WATCH: Woman Defends Husband Who Got Caught on Cam Reaching Out Another Bus Passenger's Breast! Everyday, we are dealing with different kinds of people, when we are on our way to workplaces, schools and offices. You will walk along with strangers and most of the times sitting next to them on public transportation. Strangers are people that your family does not know well. There are different kinds of strangers that you can experience, safe strangers and bad strangers. Safe strangers are people whom you can trust to and ask for help. Policemen are the best example of safe strangers. Bad strangers are mostly looking scary and dangerous. You must always have the presence of mind when you are in public places and be observant to the things happening around you. Just like what happened to Jas Mine who happened to be harassed by a guy sitting next to her on a public bus. 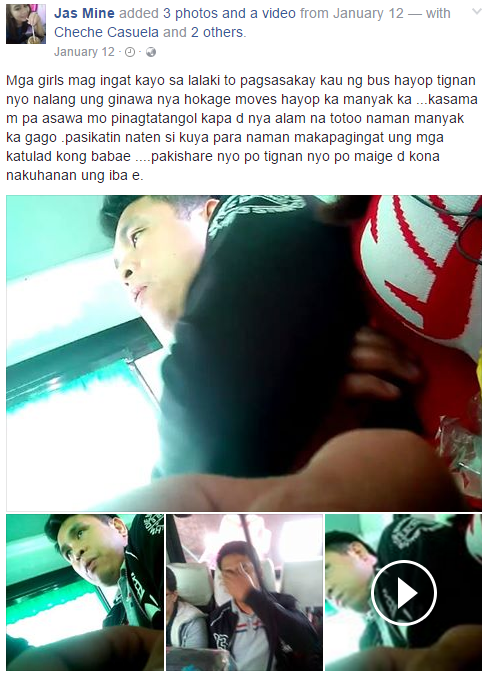 Despite of what happened, she still managed to take video of the guy while he was touching her breast. After confronting the guy, the wife reacted and defend her husband. Screenshot from: Jas Mine Facebook account. Do not just sit in silence when you know that somebody is taking advantage of you. Know your right and know how to defend yourself from dangerous strangers.